Myaccountaccess.com – Login to Check Your Balance. Myaccountaccess login help and FAQ. Check your Elan credit card balance, manage your Elan Visa card or Mastercard account settings, and view past purchases with Myaccountaccess.com. Myaccountaccess.com is an online portal, which can be used to manage Visa, Mastercard and American Express credit cards and gift cards issued by Elan Financial Services. A subsidiary of U.S. Bancorp, Elan Financial Services itself is one of the leading card issuers in the United States. The company serves more than 1,700 clients, has partnerships with 1,400 financial institutions, and offers a range of processing and payment services, as well as card issuing and prepaid card solutions. It also supports more than 43 million ATM and credit cards and also provides additional telecommunications services. 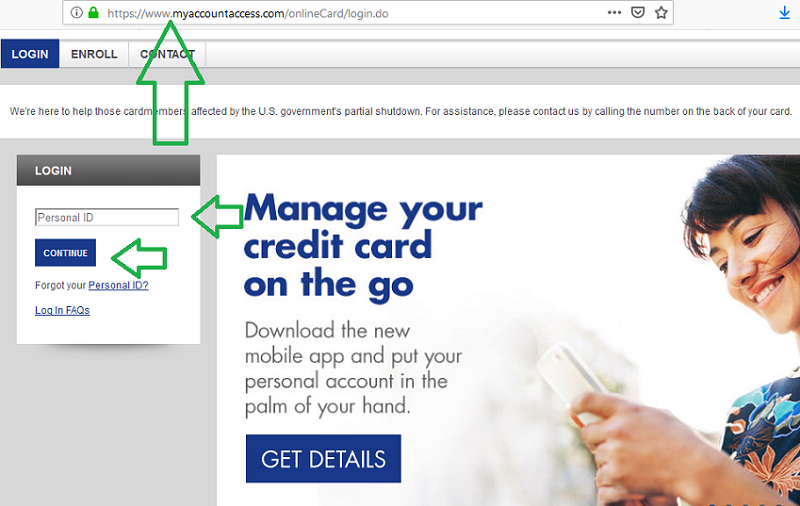 How do I register my Visa or Mastercard on Myaccountaccess.com? In order to register a Visa, Mastercard or other Elan credit card with the Myaccountaccess.com service, you must first go to the homepage and then click on ‘Enroll’. Alternatively, click here. From there, complete the registration form, providing all of the information requested, and then click the ‘Submit’ button at the bottom. To complete the process, you will need to provide your card account number, the three-digit security code, the last four digits of your social security number, and your ZIP code. Additionally, you will need to create a Personal ID and a password, which will both be used for Myaccountaccess login purposes in future. Upon gaining access to your account, you will also be prompted to set up the built-in ‘ID Guard’ security feature. You can skip this process, but if you would like the added security, simply follow the instructions. How do I activate a Myaccountaccess Elan Credit Card? Activating a Myaccountaccess Elan credit card with the service requires users to complete the registration process outlined in the last section. From there, simply log in to your account and follow the instructions provided. It is worth noting that business customers have the option to register up to 50 cards for authorised employees. Once you activate a card with the service, you will also have access to other features, such as online statements. How do I log In to my Myaccountaccess.com account? After your account has been created, you can log in by visiting the main homepage at www.Myaccountaccess.com. From there, click on the ‘Login’ option in the top right-hand corner of the screen and you should be presented with the main Myaccountaccess login form, where you will need to enter your Personal ID and a password. To do this, enter your Personal ID in the specified field and then click ‘Continue’. On the next page, enter your password, and then click ‘Log In’. If you have previously set up the ‘ID Shield’ security feature, you may be required to answer up to three security questions before being granted access to your account. Myaccountaccess Login: After entering your Personal ID and clicking on continue, a separate screen will open where you enter your password. Please be aware that you must enroll on the Myaccountaccess.com registration page before you will be able to log in for the first time. I cannot log In to my My Account Access account. What could the problem be? 1. Double check that your internet connection is working. You can do this quickly by attempting to load another website. If it fails to load, this is likely to be the cause of your problems. 2. Make sure your login credentials have been entered correctly. Remember, your password is case sensitive. Passwords are case sensitive. Passwords must be 8 – 24 characters in length, and include at least 1 uppercase character, and at least one numeric or special character. You are not able to include and spaces, three of the same characters in a row, any part of your email address or the word “password” in your password. Re-type your credentials and double check that your CAPS LOCK and NUM LOCK functions are turned off. 3. Try clearing your browser data and trying again. Alternatively, update your browser, or try using a different web browser entirely. Failing that, attempt to log in using a different device. 4. Try downloading the Elan Financial Services app and logging on through there instead. The app is available on both iTunes and Google Play. If you are an Android user, search the Google Play Store for “Elan Credit Card”, and the app will show as the first option. 5. If you are experiencing technical problems, call the technical support line on 1-877-334-0460. 6. Those who have opted in to the ‘ID Shield’ security protection and have answered the question incorrectly may find themselves locked out of their account. You will, therefore, be unable to re-gain access until you either complete a self unlock of your account or contact the technical support number on 1-877-334-0460. From time to time, it may be necessary to get in touch with the team at Myaccountaccess.com in order to ask questions, request services, or gain assistance in other ways. If you are having a problem with the website itself, you should call the technical support number on 1-877-334-0460. If you have lost your card, had it stolen, or if the purpose of your communication is otherwise related to your card, the card member service line is 1-800-558-3424. This number is available 24 hours a day, seven days a week. Finally, if you would prefer to contact the customer service department via email, you can do so from within your account. To do this, simply log in to your account in the usual way, then go to ‘Messages’ and create your message. You can also read the eventual reply by visiting this same section of the website. Add your comments and opinions about the Myaccountaccess.com website in the comment section below. 1 Myaccountaccess.com – Login to Check Your Balance. 4 Myaccountaccess.com/activate – Card Activation. Myaccountaccess.com is the most unfriendly website for the user I have every tried to use!!!! All I want to do is to check my CC balance and I have to go through all of this garbage! There has got to be an easier way. Mygiftcardsiteusa.com is an informational site only, intended for providing help and answers for users of US Bank Prepaid Gift Cards.